Robert D. Teer Jr.'s career in the construction and development industry has provided him the opportunity to work with a broad and impressive resume of clients. Among these are American Airlines, GTE, Glaxo/Wellcome, IBM, Central Carolina Bank, Northern Telecom, Research Triangle Institute, NetEdge Systems, and Biogen Inc.
Mr. Teer's professional management skills were honed at the Nello L. Teer Company headquartered in Durham, N.C. This multinational construction company was involved in all facets of construction ranging from hydro-electric dams in South America and airports in North Africa, to countless highway and office construction projects. 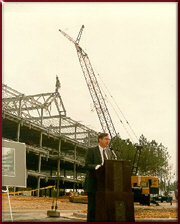 President of Teer Associates since 1986, Mr. Teer negotiated the sale of the Research Triangle Park Service Center Complex which was the largest real estate sale in the history of Durham County to that date. Teer Associates retained property management of the RTP Service Center. Mr. Teer has strategic alliances with a Fortune 500 Construction Company, a large Connectivity Company, a Furniture Outfitter, an HVAC & Clean Room Contractor, a Mortgage Banker, a Leasing Company, and an ENR 400 Site Development Company.